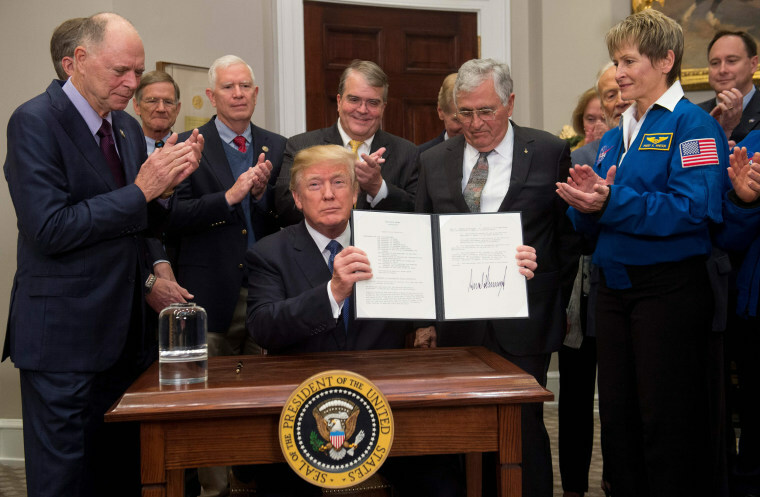 President Donald Trump signed his administration's first space policy directive yesterday (Dec. 11), which formally directs NASA to focus on returning humans to the moon. President Trump signed the order during a ceremony in the Oval Office, surrounded by members of the recently re-established National Space Council, or NSC (which provides recommendations to the president on space policy), as well as active NASA astronauts Christina Hammock Koch and Peggy Whitson, Apollo 11 astronaut Buzz Aldrin, and retired astronaut Jack Schmitt, who flew to the moon on the Apollo 17 mission. "The directive I'm signing today will refocus America's space program on human exploration and discovery," Trump said during the ceremony. "It marks an important step in returning American astronauts to the moon for the first time since 1972, for long-term exploration and use. This time we will not only plant our flag and leave our footprint — we will establish a foundation for an eventual mission to Mars and perhaps someday to many worlds beyond." "Mr. President, you've said that the pioneer spirit has always defined America," Pence said. "And by your action today — with this clear vision [of] returning Americans to the moon, preparing to lead to Mars and beyond — you are ensuring, Mr. President, that America will lead in space in the future and for generations to come." Robert Lightfoot, NASA's acting administrator, said he thinks the new directive could provide "a sense of urgency" to NASA's spaceflight pursuits. He noted that there are "a lot of people that want to help [NASA]" reach those goals, including international space partners and commercial space partners in the U.S.
"And if we can all stay focused on the same goal, we'll be okay," Lightfoot said. In a separate statement, NASA officials said that the directive also officially ends NASA's Asteroid Redirect Mission (ARM), which would have sent robotic probes and then humans to an asteroid. The Space Policy Directive 1 will "more effectively organize government, private industry, and international efforts toward returning humans [to] the Moon, and will lay the foundation that will eventually enable human exploration of Mars," agency officials said. Both the president and the vice president said today that NASA's focus on its human spaceflight program will help create jobs for the country, and both men briefly mentioned the defense and military applications of the space program. "As everyone here knows, establishing a renewed American presence on the moon is vital to achieve our strategic objectives and the objectives outlined by our National Space Council," Pence said. "In pursuing these objectives, Mr. President, we will, as you said, enhance our national security and our capacity to provide for the common defense of the people of the United States of America." The Commercial Spaceflight Federation — a member organization for human spaceflight companies — released this statement from its president, Eric Stallmer: "CSF applauds President Trump for signing Space Policy Directive 1, which directs NASA to partner with the U.S. commercial space industry to return Americans to the Moon. The U.S. commercial space industry has invested hundreds of millions of dollars in private capital to develop innovative capabilities for lunar transport, operations, and resource utilization. CSF recommends that the Administration direct NASA to leverage these capabilities to generate greater efficiency, as well as partner with industry through flexible, innovative contracting approaches, to accelerate progress towards achieving the goals set out in Space Policy Directive." Calla Cofield is a staff writer at Space.com.